Ziggurats and pyramids greatly differ in terms of purpose or function. Pyramids were originally thought to be the final resting places of the pharaohs but more recent archaeological finds have uncovered that they were built with very narrow shafts extending from the inside to the outer surface for the purpose of lifting the pharaoh’s soul unto the heavens. Ziggurats on the other hand were said to have been built to house the gods. Thus, they are the actual dwelling places of the gods themselves especially in the point of view of the Sumerians and Babylonians. In this regard, it is not a surprise that only the priests were allowed to get inside the ziggurats. Other functions of the ziggurat are the following: a retreat area for the priests in case there is a sudden overflow of water at the ground level, for the overall security of the kingdom’s priests, and it also serves to complete an elaborate temple complex with dwelling places, storage areas and courtyards to name a few. In terms of building location, ziggurats were mostly built somewhere within the Ancient Mesopotamian region (Sumer, Babylon & Assyria) corresponding to modern-day Iraq and part of Syria whereas pyramids were the infrastructures built in Ancient Egypt and South American regions. Ziggurats possess a unique feature of having steps, ramps or terraces with its sides usually receding whereas the pyramids often have a long stretch of staircases and smoother sides. Ziggurats are multi-storied structures which usually share a common feature of having seven levels or layers to represent the 7 planets of the heavens. These were also postulated to have temples at the top since there are no concrete evidences claiming such until today. There are also no chambers within these infrastructures and are typically shaped in a rectangular or square fashion. Pyramids have chambers inside and appear to have triangular outer surfaces (faces) that meet at one point at the top. Most pyramids have five faces all in all including its base although there are four-faced pyramids that have triangular or non quadrilateral bases. 1. Pyramids are simply tombs or burial grounds while ziggurats are more of temples. 2. Ziggurats were built in Ancient Mesopotamia while pyramids were built in Ancient Egypt and Southern America. 3. Ziggurats have steps or terraces on its sides and multi-storied while pyramids just have one long stretch of staircase. 4. Ziggurats were said to have temple tops while pyramids don’t have any but just a converging point for its sides. 5. Ziggurats are chamber less while pyramids usually have internal chambers. Julita. 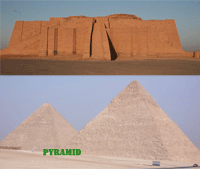 "Difference Between Ziggurats and Pyramids." DifferenceBetween.net. November 2, 2009 < http://www.differencebetween.net/miscellaneous/difference-between-ziggurats-and-pyramids/ >. Is the Israelite Temple considered a ziggurat? I find these two words used incorrectly and interchangeably. So are the structures in S. America Pyramids or Ziggurats? Isn’t Ziggurat a word reserved to describe these structures in Mesopotamia?